In the last 6 months, I have probably done more knitting than in the last six years. This is largely due to the fact that I discovered the joys of lace. I had never tried it before, but heard from other knitters that it was difficult and fiddly and complicated. As I dabbled in knitting as a hobby, I wasn't particularly inclined to give it go. However, I had to admit that some of the lacy patterns I'd seen were very pretty, with intricate, detailed designs. So I decided to try it out just once in a bid to improve my skills and at least attempt lace before I dismissed it completely. You never know until you've tried. To this end, lace knitting was added to my list of Things To Do Before I'm 30. Oh how wrong I was! First I would like to say that lace knitting is not hard! It requires patience and concentration, but it is no more difficult than knitting anything else. Indeed, the fact that it required more concentration and thought really engaged me, and I discovered that far from being frustrating and annoying, lace knitting is absorbing. 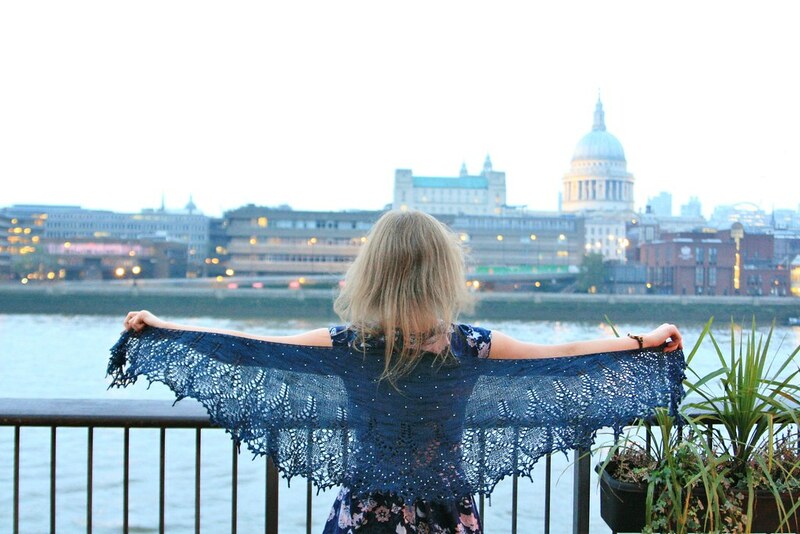 Instead of thinking of knitting as something to mindlessly occupy my hands when watching a bit of telly, lace became something I wanted to work on in its own right. I love knitting patterns like this. I like the delicate details and the feel of soft, fine yarn, and learning to add tiny beads into the design was the cherry on top. I've since embarked on more lacy projects, and because the knitting is so portable, I've taken to knocking out a few rows on my commute to and from school. The only problem was that my completed lacy shawl sat scrunched up in a draw, unworn, for several months. Because once again, I had to master a new skill before it would be finally ready to wear. That new skill was blocking. Blocking involves soaking a knitting project and then stretching and pinning it out flat into the right shape. Then you leave it to dry and hope that the finished result is pretty. 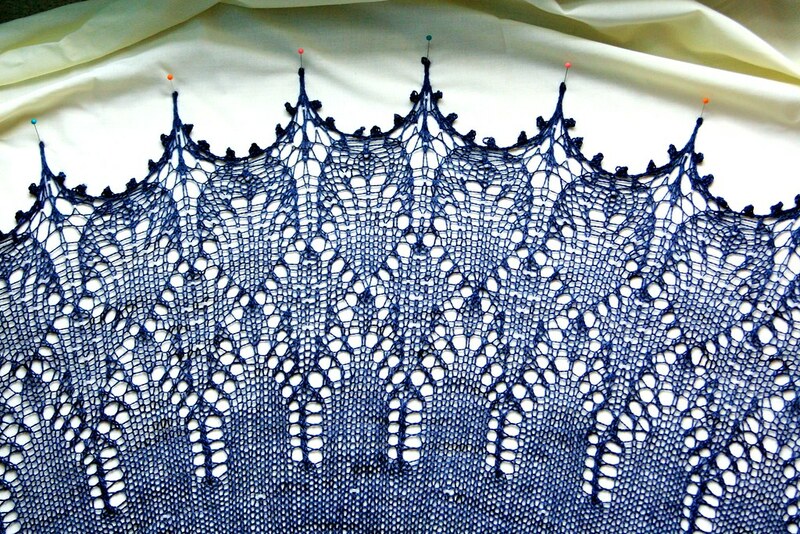 Blocking is extremely important in lace, because the design doesn't really make much of an impact without it. It just looks a bit sad and tangled. I had put off doing the blocking under the impression that I needed a lot of equipment and space and time, and that the process would be difficult and potentially ruin my lovely shawl if I got it wrong. Once again, I was wrong. I picked up a couple of packs of pins and improvised, tacking that shawl firmly to the bedroom carpet. And the results were better than I could have hoped for. The design really opened out and the detail appeared. Brilliant! 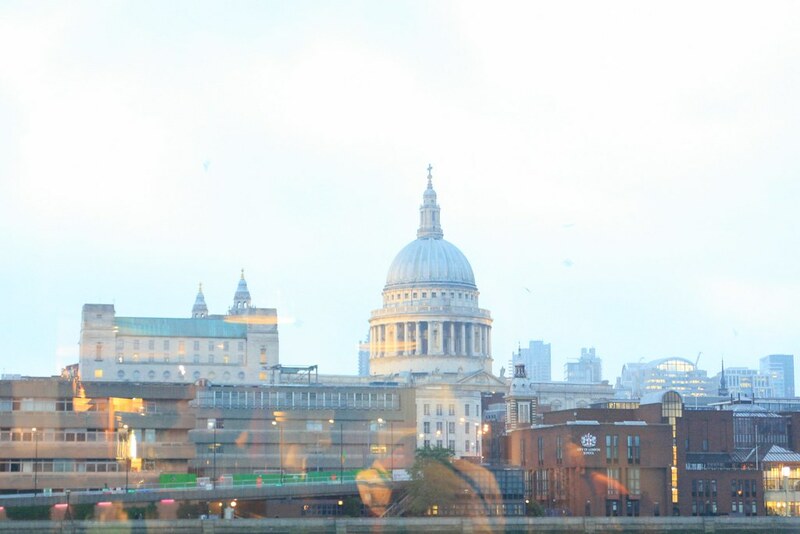 The man and I spent a very lovely Sunday afternoon on the South Bank of the Thames, strolling through the Christmas markets popping up along the river, before settling into a cosy pub to indulge in a hearty meal. The Founders Arms is right on the river and we go there quite regularly, as the location and views are wonderful. The food's pretty yummy too, and they always seem to be among the first pubs to add mulled wine to their repertoire when the temperature drops. Anyway, if you find yourself loitering on a terrace looking across the Thames towards St Paul's Cathedral, and you happen to wearing a shiny new crafty project, then you may as well play photoshoot while you're at it. The man was pressed into being photographer for me, and therefore clearly earned a sojourn in a nice, warm riverside pub with a toasty glass of the capital's finest mulled goodness. After all, that's what Sunday afternoons are for. P.S. 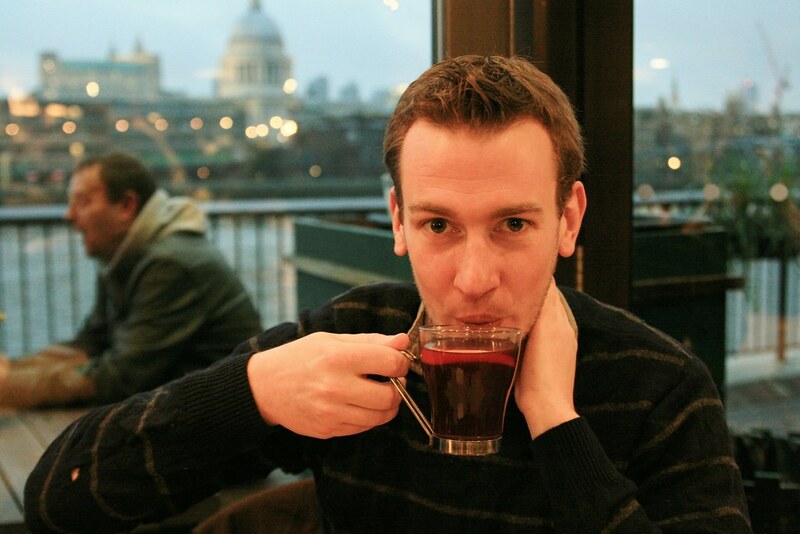 If anyone tells you I had four glasses of mulled wine during the day, don't believe a word of it. As if I would possibly do such a thing on a cold, crisp day when the city is starting to think wintry thoughts. P.P.S. It's definitely not true, because one of them was called "Spiced hot wine with brandy" and emerged steaming from a giant copper kettle. And one of my receipts says it was hot sangria. 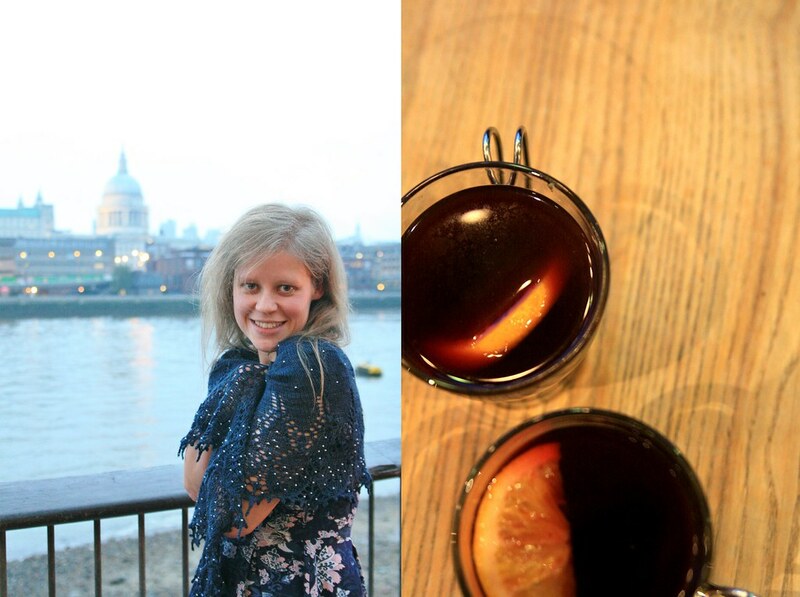 So I really didn't consume 4 mulled wines. Fact. You've done a great job, it looks beautiful! The shawl is stunning....love the first photo. This is so beautiful. I can't even imagine knitting anything so intricate! Lovely photos too! What a fab project it's beautiful.